On October 18, 2007, the twenty musicians of Different Skies 2007 came back to their rigs on the main stage at Arcosanti after a lovely dinner and a few drinks each, sat down, and began to improvise. The concept of live electronic improvisation isn't new by any means. But there's a difference between improvisation among one, two, or three musicians, and improvisation among twenty of them. When you've created a veritable orchestra of electronic musicians, any one of which has enough gear to carry a full song arrangement on his own, putting them on the same stage and yelling "GO!" carries one hell of a set of risks. 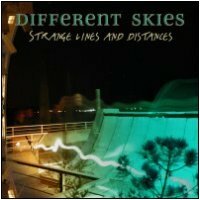 The mantra of Different Skies is and has always been, "Listen Twice / Play Once." In a setting like this one, it is vital that musicians use their ears and only venture onto the canvas very gingerly to add their colors to the palette. Mistakes happen often, and there is the ever-present risk of piling noise upon noise until the result is impossible to listen to. But when these problems are circumvented, the results can be magical. On this night, the musicians jammed for two hours without a break, with a small audience of Arcosanti residents in the Colly Soleri Amphitheatre and somewhat more of an audience on the Internet via StillStream and Second Life (thanks to Bibi Book for the SL rebroadcast). P.S. Be sure to check out the companion release, also available on Earth Mantra, which contains music from the live improvisations by the same crew on the following night.